According to Los Angeles World Airports (LAWA), Los Angeles International Airport (LAX) is the 6th busiest airport in the world and 3rd busiest in the United States, serving 61 million passengers annually in 2012. The proposed Project is an integral part of the infrastructure and modernization program at LAX and Los Angeles World Airport’s (LAWA) commitment to maintain a safe and secure airport. As part of the proposed Runway 6L-24R Safety Area and Associated Improvements Project, Runway 6L-24R and service roads at LAX will be improved to enhance safety and maintain efficient operations. Portion of Argo Ditch where the precast concrete box culverts will be installed and backfilled. Source: https://www.lawa.org. 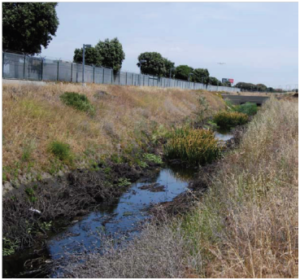 As part of the construction of the proposed Runway Safety Area (RSA), a portion of the nearby Argo Ditch will be covered. In order to maintain an unobstructed, steady flow of water, a triple cell box culvert – which is a combination of a double and single 10’ inside width by 8’ inside height – will be constructed prior to backfill. The two different configurations of box culverts will be laid out side-by-side to form the required triple cell box culvert. There was an additional challenge which is to design the precast concrete box culverts to handle the heaviest aircraft possible to land at the Los Angeles International Airport (LAX) which was modeled to be the Airbus A-380. With Pro-Cast Products extensive experience and highly knowledgeable design team, we were able to get the approval on the precast box culvert design that we confidently believe will safely handle the massive load. The shop drawing on how the single and double precast concrete box culverts will be laid out side-by-side on site. Source: Pro-Cast Products shop drawings. To date, Pro-Cast Products had already successfully designed and produced triple and quad cell precast concrete box culverts. 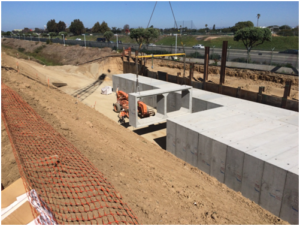 Pro-Cast Products is the first (and may be the only precaster up to this writing) to get a design approval from Caltrans to produce double and triple cell precast concrete box culverts for them. Noting that Caltrans’ Standard Plans D83a 2010 (and 2015) only list single cell precast concrete box culverts. A precast concrete box culvert is a perfect solution to this type of application where quick installation is required in a tight construction timeframe. Pro-Cast Products had finished the box culvert production ahead of schedule and made sure they were cured and ready for delivery at the time the general contractor was ready for installation. Actual installation of the precast concrete box culverts. Source: Site photos. Backed by our strong engineering, production and quality control team, we are confident that we can design, manufacture and deliver every precast concrete product with pride. Pro-Cast Products is always ready to help you find precast concrete solutions to all your structural, civil and architectural construction needs. For more information and questions, please contact any of our sales staff at 909-446-9412 or send us an email to info@procast.us.